Winston Trails is a gated golf community located in Lake Worth, Florida. Residents of the community enjoy great amenities with a low-maintenance lifestyle. With almost 1,900 single-family homes spread across 20 unique neighborhoods, potential homebuyers have a myriad of resale homes from which to choose. Winston Trails offers excellent amenities to its residents. The community clubhouse is the focal point for clubs and activities in Winston Trails. Here, residents gather to enjoy each others' company playing cards, participating in fitness classes, or just lounging by the pool. There is an active tennis program in the community which utilizes the eight courts and organizes tournaments and lessons for residents. Winston Trails is also home to the Winston Trails Golf Club. This semi-private club offers great membership opportunities and provides world-class golf and amenities. Inside the golf clubhouse, members enjoy a state-of-the-art fitness center, golf pro shop, and men's and ladies locker rooms. The Avanti's at Asherwood restaurant at Winston Trails is a great place to grab a bite to eat after a round and offers outdoor patio seating. Built between 1994 and 2002, Winston Trails offers great single-family homes on a resale-only basis. With close to 1,900 homes, this community is not your average neighborhood. Homes in the community range from 1,400 to over 4,000 square feet of living space. Whether you are looking for a smaller villa or a larger estate home, Winston Trails will be able to meet your needs. All homes have at least one to three bedrooms, one to two bathrooms, and an attached garage with beautiful golf course or water views. Winston Trails is an active lifestyle community with numerous clubs and activities. Residents meet in the community clubhouse for many planned events such as book club, card club, and fitness classes. Tennis tournaments draw big crowds and offer great competition for all levels of play. Holiday parties in the clubhouse are a big hit and offer great opportunities to catch up with neighbors and friends. Winston Trails is located in Lake Worth, Florida close to the Florida Turnpike and I-95. 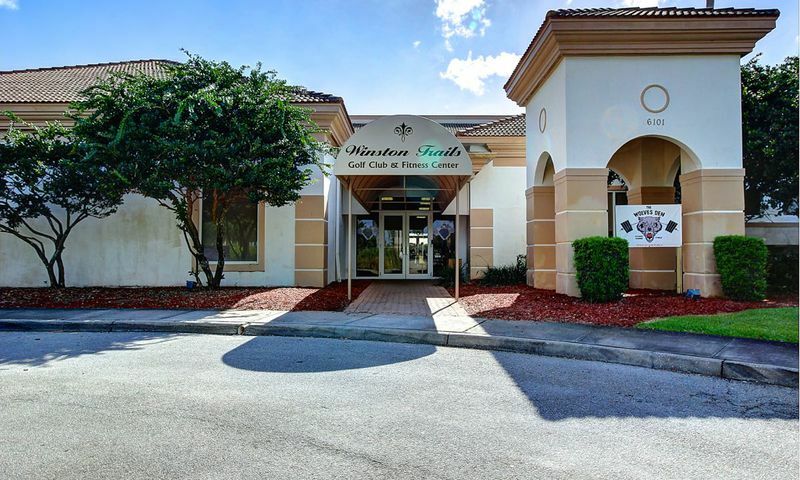 This convenient location offers easy travel to the rest of Florida. For those traveling a little farther the Palm Beach International Airport is a short drive away. Residents enjoy the close proximity to the beautiful beaches of Florida's Atlantic Coast and the many shopping, dining, and entertainment opportunities in the Lake Worth and Boynton Beach areas. Winston Trails in Palm Beach County is perfect for homebuyers who wish to live in an established community with great golf and tennis amenities. The Winston Trails Clubhouse is home to amenities available to all residents. The Winston Trails Golf Clubhouse is a semi-private clubhouse. The amenities in this clubhouse are only available to members of the Winston Trails Golf Club. There are plenty of activities available in Winston Trails. Here is a sample of some of the clubs, activities and classes offered here. Homes in the community range from 1,400 to over 4,000 square feet of living space. All homes have at least one to three bedrooms, one to two bathrooms, and an attached garage with beautiful golf course or water views. Please Note: Not all floor plans are available at this time. Winston Trails is a very nice community. We've lived here for 4 years this month and made the transition to our new neighborhood really well. We've met a lot of great new people and joined the golf club too. Getting involved here is very easy. There are plenty of activities, events and clubs to join so you can be as active as you want. The people here are friendly and welcoming so we felt right at home from the day we moved here. 55places.com is not affiliated with the developer(s) or homeowners association of Winston Trails. The information you submit is distributed to a 55places.com Partner Agent, who is a licensed real estate agent. The information regarding Winston Trails has not been verified or approved by the developer or homeowners association. Please verify all information prior to purchasing. 55places.com is not responsible for any errors regarding the information displayed on this website.